Nexa Rust is a multifaceted font system from Font Fabric! 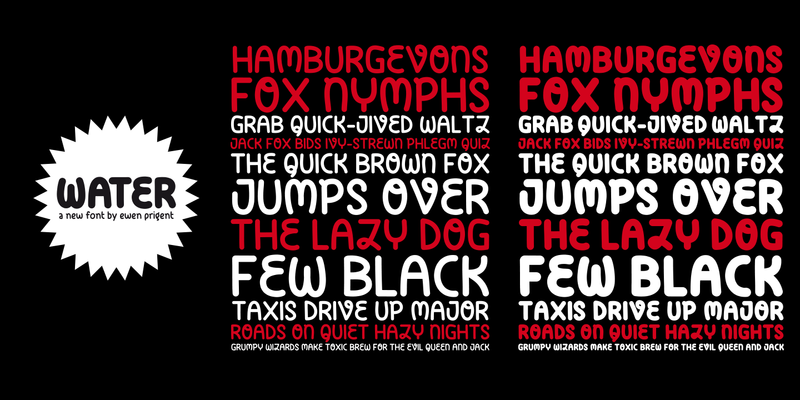 It consists of font sub-families Sans, Slab, Script, Handmade and Extras. Each of these sub-families contains a number of font weights which have a characteristic warm, rough look and display a few degrees of saturation. Five (5) fonts from all 83 are available for free download. Can be used in commercial as well as in personal projects! Make sure to check out the Full Version. Water by Ewen Prigent is somewhere between a script, handwriting and childish printing. It's the ultimate answer to Comic Sans without being Comic Sans. Don't laugh . . . look deeper. You need to visit La Boîte Graphique ... but you'll need to also speak and read French! Corey Miller is a Writer/Producer in Los Angeles, U.S.A. who takes lots and lots of photos. I mean lots and lots! Corey has amassed a simply amazing collection of photos from all over the place -- and particularly his encyclopedia of vintage signs. You need inspiration? Look here. (And, if you yearn to learn more, just arrive at his blog called . . . Although some of the characters are uncomfortable, Jeboy typeface is a free spirited script font that can liven up your seasonal party flyers, posters, apparel design, logotype and much more! Go ahead and download it . . .
Then click the link below the video to visit the museum and see the whole history. Previously: 22nd Fonts Fest Surf Three . . .